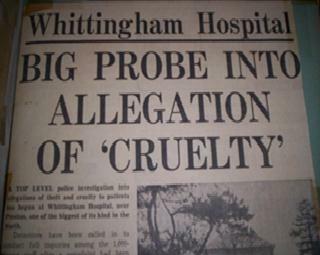 The unrest at Whittingham can be traced back to 1965 when two items appeared in the hospital magazine “Contact”, the author being a Medical Assistant in Psychiatry. These articles highlighted unrest amonst students and shortfalls in training on the wards. These were followed by a letter from a student who complained of conditions for patients within St Luke’s division. There then followed a constant flow of complaints from student nurses, mostly, but not wholly, about female wards. The then Hospital Management Committee chose to ignore all these complaints. Smouldering discontent caught alight when, in 1967 a book entitled “Sans Everything”, describing conditions in long stay institutions, was published. On 18 July 1967, the student nurses association held a meeting with the head tutor in the chair, voicing their concerns and lodging serious complaints of cruelty, ill treatment and fraud. The Head Male Nurse then acted quickly; he called a meeting of all the students; the meeting was reported to have been “stormy”. The students were told that the content of their complaints was material for the law courts and they were threatened with actions for libel and slander; because of the fear of reprisal or being singled out, the students would not pursue the matter further. The Head Male Nurse and the Matron then demanded the names of students and details of the complaints. The meeting ended and the minutes were suppressed; nothing further occurred until March 1968 when a new Psychologist took up post. 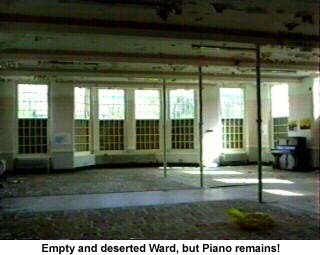 The new Psychologist was appalled at the conditions on some of the wards, and said so! This action identified the new Psychologist with the dissident students interests. It was at this time that the students, the Psychologist and the Assistant Medical Officer in Psychiatry pooled their discontent. Another meeting was held and the students were told by the Head Male Nurse to “put up or shut up”. 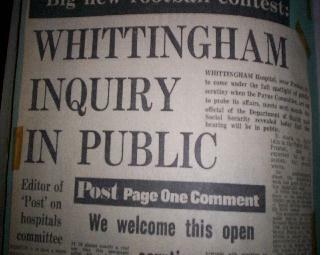 The Hospital Management Committee heard about this meeting and discovered the suppression of the minutes of the previous meeting of July 1967 and issued reprimands. Both the Head Male Nurse and the Matron retired. An inquiry into allegations was announced and a new Chief Nursing Officer was appointed within one month of the announcement. The inquiry divided the complaints into three specific headings: 1) Care of Patients, 2) Organisation of Services, and 3) Financial Control. 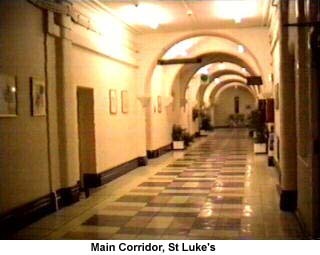 The complaints of ill treatment of patients referred to four wards, two female and two male, the worst being ward 16 (female), all within St Luke’s division. 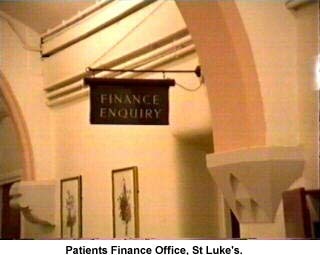 The complaints listed: Patients left untreated; Patients given only bread and jam, regardless of menu; given a spoon only regardless of diet; food mixed up and served as “slops”; Patients restricted in fluids during and after meals; put to bed in only vests; left queueing on the stairs waiting for a bath; certain patients locked in rooms under the stairs; Patients put out and locked out in the airing courts, regardless of weather conditions; certain patients locked in the washrooms. 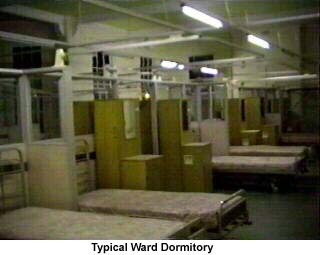 Until September 1969 this ward (16) had remained under the control of one Sister who had been in post for 47 years! Ward S3 was mentioned in that students alledged they had witnessed patients being dragged by their hair. 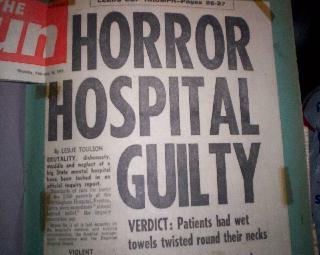 On ward 3, a male ward, the main allegation was that there were incidents of the “wet towel treatment”; this involved twisting a wet towel or bed sheet round a patients neck until the patient lost conciousness. Patients were also alleged to have been seen to be punched and locked in a storeroom. 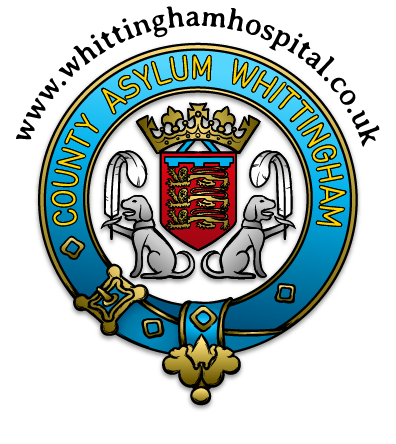 On ward S2, another male ward, it was alleged that two male nurses had poured methylated spirits into the slippers of one patient and into the dressing gown pocket of another, and set them alight. There were more complaints of wards being too hot or too cold and damp, and temperatures of 46 degrees or less were reported. There were allegations of patients being roughly treated and restrianed by being tied to chairs. It was also reported that some wards were infested with cockroaches and ants, all of which crawled onto patients, their clothes and bedding. There were some complaints that the food was inadequate. Under the second heading, there were complaints that: insufficient provision of adequate medical staff had been made; not enough nursing staff; wards too crowded with no new equipment; poor training on the wards; bad communication between male and female sides, medical and nursing staff, and between junior and senior staff; bad deployment of nursing staff. Under the final heading, Financial Control, it was alleged that there was a lot of petty theft at ward level, and more serious fraud: books not being kept; books that didn’t tally with actual figures; theft of property and goods; theft of cigarettes (some being sold back to the patients at inflated prices). One Charge Nurse was quoted as saying, “if you were not in on the corruption, you didn’t get on”. 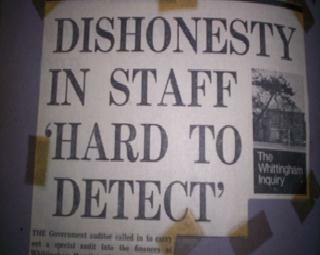 There were other statements made to the effect that: “everyone’s in the racket, just look at who changes their car every year and who takes regular holidays abroad; who takes their wife out for expensive meals two or three times a week; how many people were having new bungalows built recently?”, then the individual is recorded as stating “I’m not saying any more”. All complaints were firmly and consistently denied by all involved. In 1968-69, £91,000 was issued from sources for patients use, yet only £42,000 was recorded as having been spent in the hospital shop(s) – the remaining £49,000 is not easliy accounted for!